Xbalanque was one of the two Hero Twins that figured in the Mayan mythology, as written in the Mayan book Popol Vuh. In the book, Xbalanque and his brother are ballplayers who are pitted against the lords of the underworld after the lords kill their father and uncle. They are asked to play a ballgame with the underworld gods. Xbalanque is also associated with the howler monkey scribes who were considered the patrons of arts and creative works in the Mayan mythology. 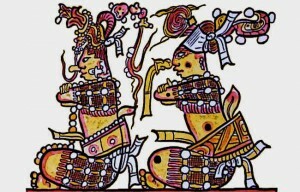 According to Mayan mythology, the father and uncle of Xbalanque were killed when the lords of the underworld were annoyed at the noise of their ballgame. But the skull of Xbalanque’s father spat on a maiden’s hand and Xbalanque and his brother Hunahpu were conceived by her. The twins showed supernatural powers right from the start. They were pitted against the lords of the underworld in a bid to avenge the killing of their father and uncle. After baffling the lords with their tricks and traps, they ultimately defeated them conclusively. Xbalanque was the protagonist of the Popul Vuh legend involving the Hero Twins. Xbalanque was the protagonist of the Popul Vuh legend involving the Hero Twins. While his brother, Hunahpu, was smarter and more active in their adventures in the world above, Xbalanque was more victorious in their underworld adventures. Xbalanque was also the best ballgame player. According to Mayan mythology, he and his brother went to play ballgame at the same place as their father and uncle. As Xbalanque and Hunahpu were playing, the lords of the underworld were annoyed once again and summoned the twins to play at the their court. Along the way, the twins were faced with many traps but they evaded each of them successfully. Finally, they played at the ballcourt of the underworld lords and suffered defeat on purpose to endure even more tests and baffle the lords at their own tricks in these tests. Xbalanque and his brother were asked by the god Huracan to tackle Seven Macaw. Seven Macaw was a minor god who claimed to be the sun or the moon and had found a large followership on Earth. He was vain and arrogant. The Hero Twins sneaked up on him and tried to hurt him with a blowgun but they were only able to wound him. Using trickery later, Xbalanque and Hunahpu were able to pluck the ornaments from his eye, forcing him to die of shame. They later destroyed both his sons as well who were equally arrogant. Xbalanque and his twin played many ballgames in the underworld. The first ballgame they played annoyed the underworld lords, so they were invited by them to play at their court. At the first ballgame played with the underworld lords, Xbalanque and his brother deliberately lost. They were given the punishment of facing the tricks and traps of the lords. They successfully passed them and came back for a second ballgame, where they again lost deliberately. At the third ballgame, Xbalanque and his brother defeated the underworld lords. After their defeat at the third ballgame, the underworld lords sought to punish the Hero Twins. They prepared an oven and invited Xbalanque and his brother so as to trick them into the oven. The Twins saw through the trick but went into the oven and were burnt to powder. They later regenerated with new faces and started performing miracles in the underworld. When their repute reached the underworld lords, they were summoned to perform miracles in front of them. Xbalanque cut his brother into pieces and then revived him back to life later. This amazed the underworld lords and they asked him to perform a similar miracle on them. Xbalanque similarly cut their body into pieces but didn’t revive them. This brought about the effective downfall of the underworld lords. One Hunahpu was the father of Xbalanque and Hunahpu, the Hero Twins. Their father had been decapitated by the underworld lords earlier in Mayan mythology. After defeating the underworld lords, the twins returned to the ballcourt where their father was beheaded and tried to revive him back to life. Although they succeeded in this, their father couldn’t function normally. So they left him at the ballcourt with assurances that the pious would pray to him in the future. After Xbalanque and his brother Hunahpu concluded their adventures in the underworld, they ascended from the underworld to the surface of the Earth. After ascending to the surface, they kept ascending further and went into the sky. Once in the sky, they turned into the Sun and the Moon. Their ascension to the sky marked a new age in the Mayan mythic cosmology. According to Popul Vuh, Xbalanque and his brother Hunahpu had an antagonistic relationship with their half-brothers. So by using their supernatural powers, the Hero Twins turned their half-brothers into monkeys. These came to be called The Howler Monkeys and in some Mayan tradition, they are esteemed as the patron of arts, music, scribes and sculptors. Xbalanque was one of the two Hero Twins who descended into the Mayan underworld. The two Twins went into the underworld in order to face the underworld lords. They defied the tricks and traps of the underworld lords through extraordinary feats. Xbalanque, in particular, was the Mayan mythological character who played a central role in the success of the twins during their underworld exploits. The Twins invited the underworld lords to ballgames. At the final ballgame between the Twins and the lords, the Twins defeated the lords. They were killed by the lords but the Twins regenerated and came back to exact revenge. They killed two of the lords while the rest of them succumbed to them. In this way, the Twins were able to bring about the fall of the underworld lords. Xbalanque, together with Hunahpu, being the two Hero Twins, enjoyed nearly semi-divine status in Mayan mythology.